The Kunsthistorisches Museum Wien (art museum Vienna) is one of the premier museums of fine arts and decorative arts in the world. 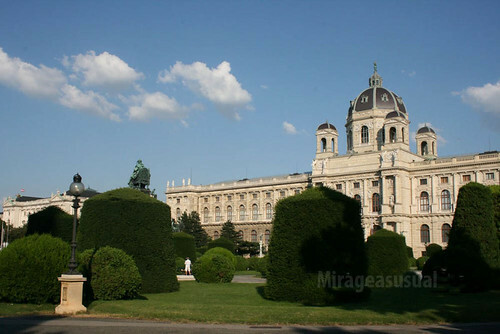 The museum has an identical building opposite it, the Naturhistorisches Museum (science museum) and were both opened in 1891 by Emperor Franz Joseph I. The main purpose of the museums were to house the collection of the Habsburgs…art and design at one and fossils, prehistoric artworks, even jewelries owned by the empresses on the other. I unfortunately do not have the time yet to visit the displays at the museum, among the collections were of famous painters Dürer, Raphael and Michaelangelo. I like to visit like that because I like arts. Nice entry. Mine also is up hope you visit. That looks like a place you can spend a lot of time exploring. Nice photo. Visit mine for Huggable Christmas trees. Fascinating! The museum looks beautiful and full of historical info. Would love to visit! Awesome shot! I love museums especially if there are fossils and other artifacts! G, too bad we were unable to go inside these museums… it sound interesting pa naman.